Open a new database: Start and configure a new lottery by selecting either the open folder icon on the toolbar or from the menu select “File” then “Open/New Lottery” from the resulting drop down list. After you have selected one of these options you will be presented with an open dialog box similar to the one displayed below. A) Type in a title for your lottery in the text box beside “File name:” If you are playing Florida lotto for instance you may want to type in “Florida Lotto” another example may be “Texas Lotto” if you are playing Texas lotto, or “Lotto 6/49” for Canada’s Lotto 6/49, or “Powerball” for powerball type lotteries, “Singapore Toto” for Singapore Toto, whatever you decide you want for your title is up to you. B) Now click on the “Open” button. After you click “Open” you will be presented with a “New File Settings” dialog box similar to the one displayed on the next page. C) Open an existing database: To open an existing database simple highlight the lottery you wish to open and then click open. You can also double click the lottery you want to open and this will have the same effect. After either of these actions takes place Lotto Logic will automatically close the lottery currently open and then load your selection. This dialog allows you to configure Lotto Logic Pro to suite your lotteries requirements. A) Select either 0 or 1 as the starting number of your lotteries pool of numbers. B) Select the ending range of your lotteries pool of numbers by using the up and down scroll arrows to the number with which your lottery ends. C) Now use the scroll arrows to select how many numbers are drawn from your lotteries pool of numbers. D) If your lottery also draws a bonus number you now should select 1 or 2. If your lottery does not have any bonus numbers select “None”. Selecting “None” will gray out the powerball check box. “POWERBALL type lotteries only” for power ball type lotteries you need checkmark the check box labeled “Check here for PowerBall type lotteries” When you check this box a number option will appear below which enables you to change the powerball number if required. If the powerball is different than your main pool of numbers change it here. Now select either 1 or 2 powerball numbers. Once you check the powerball option, bonus numbers are switched to powerball numbers. E) Now click OK. A confirmation dialog will now appear to confirm your setting choices. · Main database files have an ‘*.llp’ extension. · Backup files have a ‘*.blp’ extension. · Search result files have ‘*.sr*’ extensions. Always use the ‘*.llp’ extension for your lottery data. Files with extensions other than ‘*.llp’ will automatically be overwritten during certain operations. For example ‘Backup’ automatically overwrites the corresponding file using the ‘*.blp’ extension; same thing with search result files. You can save any files using the ‘*.blp’ or ‘*.sr*’ extension as a primary file by right clicking the ‘Open/New’ button and saving the file with a ‘*.llp’ extension. ‘Save as’ is also available from the ‘File’ Menu. The “Data Entry – File Maintenance” tab shown below allows you to enter and maintain your data. Before you start to enter past draws you need to be on the “Data Entry – File Maintenance” tab. A) Click on the Race Car, this will bring you right to the tab and set you up for a new entry. This will also begin the first step of the “Five Easy Steps”, which is also available from the Menu “Five Easy Steps”. B) Or click on the tab labeled “Data Entry – File Maintenance”. If you click this option you need to click on the button labeled “New” (indicated with the letter E in this screen shot) to clear the entry boxes and set you up for a new entry. C) The blue bars indicate where you enter your lotteries main pool of numbers. The red bar or bars indicate where you enter your bonus or powerball numbers if required. D) The purple bars are where you enter your past winning numbers draw date. Enter the date in the following order. Month/Day/Year. E) This button will either read “New” or “Save” if you are about to start a new past draw entry it will read “New”. Once you are in New Entry Mode, it will read “Save”. Once you have entered all your numbers click save. To move forward through the entry boxes use the tab or enter keys. To move backward use the ctrl key or (shift-tab) key combination. You can always move backward through the boxes but can only progress forward to the next box after the box you’re on has valid data entered. At the end of the entry boxes is a button reading ‘Save’ or ‘New’. If you have started a brand new entry this button will read ‘Save’ and does just that – saves your entry. If it reads ‘New’ clicking this button will put you into New Entry mode. · Press the escape key. · Click the arrow to move down an entry. · Highlight any past draw in the display list. · Move to another tab in the program. If you have partially filled in or completed filled in a new entry and take one of these actions before saving, the entire entry will be discarded without any notification. Click ‘New’ and the button will change to ‘Save’. The program will clear the entry boxes for you to enter your numbers and will enter the current date set on your computer for you. Proceed through the entry boxes using the ‘Enter’ key. Once you reach the ‘Save’ button press the ‘Enter’ key to save your entry and the button will change back to ‘New’. If you have more entries to make, just press the ‘Enter’ key once again to go into new entry mode and start the cycle all over again. If you are about to enter several months or years worth of past draws in one session, turn off the A) ‘Auto Month’ and/or B) ‘Auto Day’ insert options by deselecting the appropriate check boxes. This way you don’t need to clear the month and/or day entry boxes every time you make a new entry. Don’t forget to change the year when necessary. If you enter draw numbers immediately after every draw, leave these boxes checked. This way the complete date will already be entered for you. If you normally enter your draw numbers a day or two after the draw date don’t forget to change the draw day and/or draw month if necessary. To correct errors in any winning past draw which you have entered incorrectly, simply correct the mistake then click ‘Resave’ to save your changes. To delete an entry, have the entry you want removed showing in the data entry boxes and click ‘Delete’. To delete many entries at once you can highlight as many as you want in the list and then right click the ‘Delete’ button. Select ‘All Highlighted’ and all the selected entries will be deleted. Warning: All deletions are permanent. Tip: Backup your data regularly. Click ‘Back Up’ to back up the file currently in use. This action always overwrites the existing backup file if one exists. It will make an exact copy of your current data file but uses an ‘*.blp’ extension. Another way to back up your data is to use ‘Save as’ and save the file with a new filename or in another directory. Note: ‘Save As’ will automatically switch you to your new file. If you happen to have a back up file open and click on ‘Back Up’ you will notice that the operation failed. Lotto Logic 2000 cannot back up a back up file. To back up a back up file use ‘Save As’. Note: Switching to a new file is the equivalent to starting a new Lottery from scratch. Your ‘Range Tracker’ list will be cleared as well as ‘My Numbers’ but all your winning tickets will remain. To get your ‘Range Tracker’ and ‘My Numbers’ back, simply switch back to your original file. ‘Date Sort’ enables you to enter past draws you have missed or just want to add. Running ‘Date Sort’ will put these entries where they belong in the file by date. To use Lotto Logic Pro properly you need to maintain a complete list, meaning no missed entries from the start date to the end date. If you happen to miss a draw or come across some past draws you simply want to augment, add them and then run ‘Date Sort’. For now, you are responsible for maintaining a consecutive list of entries from the start date to the end date. Coming in a future version will be a new feature called ‘Date Checker’, which will do this for you. Clicking ‘Print’ will print only the entries displayed in the list. This is true for all print routines in Lotto Logic Pro. It will only print what is showing in the list at that time. To print everything, you must have all entries displayed in the list before you start to print. For example, to print the entire Database of winning past draws change the View option to ‘All’. If you only want to print certain past draws, highlight the ones you want and right click the ‘Print’ button then select ‘All Highlighted’. To start a search, click the ‘Search’ button. Once clicked, several things will change as you go into search mode. The list box will clear and new options will appear on the lower left. In addition you can select any entry from the past just before you start a search and this past entry will be ready for searching. If you want to search something else click ‘Clear’ and the boxes will be cleared. Total search results will be displayed to the left of the ‘Clear’ button. Search has many uses. You can search numbers to see whether they have won before. You can also search out all the draws from a certain year or anything else you may think of. Searching by date always seeks out an exact date match. For example, you may enter 03/22/98. Click ‘Search’ and any draw matching 03/22/98 from the database will show up in the list box below. If you omit any one of these numbers, you will not receive a result. Searching by numbers always seeks out an exact number match. For example, you may enter 2,2,2,2 from a pick 4 draw. Click search and any draw matching the numbers 2,2,2,2 exactly from the database will show up in the list box below. If you leave any one of these number boxes blank, you will not receive a result; your search will only return exact matches. Searching by any match lets you search by date, numbers, or both without being exact. What this means is you can search the database by month, day, or year, or any combination of these dates. It also enables you to search for entries containing only a certain number or combination of numbers. You can also search by date and numbers or with any combination of both. Below are several search techniques to give you an idea of how this powerful feature works. For the examples we will use a 6/49 lottery. Entering 2,2,2,2,2,2/2 will return all entries containing the number two in any position. Entering just the first number with a 2 and leaving the rest blank will return only entries beginning with 2. Entering just the bonus number with 49 will return all entries containing 49 as a bonus. Entering 5 in the 3rd entry box will return all past draws containing a 5 in the third position. Entering the second position with a 14 and the sixth position with a 38 will return all entries containing these numbers in those positions. Entering just the month with a 4 will return just the draws entered in the 4th month. The same search, but adding 1998 as the year, will return all entries made in the 4th month of that year. To search for all entries in the year 1998, just fill in the year with 1998 leaving all other boxes blank. You can also intertwine the examples above by entering numbers and dates. One example would be to get all the entries in 1998 that have a 33 as a bonus number. So you would enter 1998 in the year and 33 in the bonus number position. Printing and saving your results are two additional options available to you when you have results showing. Click ‘Print’ to print your results. You can also just print certain results by highlighting the ones you want and right clicking the ‘Print’ button. You can save the results from any of the three search patterns. If you want, you can turn your result file into a primary file. For example, say you used Any Match to search for all the draws in 1999 and want to start a new file with only entries from that year. You would click ‘Save’ and the file would be saved as ‘*.sra’, ‘a’ specifying that these are the results from Any Match. Leave search mode by clicking the ‘Finished’ button then you would open the ‘*.sra’ file. Now right click the ‘Open/New’ button and use ‘Save As’ to save the file using an ‘*.llp’ extension. · Date results are saved with an ‘*.srd’ extension. · Number results are saved with an ‘*.srn’ extension. · Any Match results are saved with an ‘*.sra’ extension. Before starting the five easy steps you should have the numbers from the last draw ready. A quick way of getting your numbers is to use the “My Numbers Website” feature. This feature allows you to load in the website address where you normally get your numbers. Clicking on the button with the Explorer emblem will invoke your default browser and load the website page with your numbers. Step 1) Start the five easy steps by clicking on the racecar button with the checkered flag located on the toolbar. This will set you up to enter the Winning Numbers from the last drawing of your lottery. Enter the Winning Numbers and click ‘Save’. Step 2) Now click on the button with the hand holding a marking pen. This will let you open the Tickets you have saved and or played for the lottery you have just entered the results of. You will notice the numbers you entered in the previous step are displayed above on the ‘Ticket Checker/Selector’ tab. Open the ‘*.tks’ ticket file and Lotto Logic 2002 will check your numbers. You can sort the tickets to view the most matched tickets. Range Finder is one of the many powerful features you will find in Lotto Logic. It’s also what sets Lotto Logic Pro apart from all other lottery programs. Instead of just entering past draws and relying on static sets of past draws for results, LL2 will run through the entire database of past draws and find the best range of past draws for you to select numbers from. Step 3) Start by clicking on this toolbar button. You will then be asked if you want Lotto Logic Pro to find the best range of past draws for you to select numbers from. Select yes and Lotto Logic will select the best range for you. It will then ask you if you want to save the range to the ‘Range Tracker’ list. Every draw you should add at least one best range to this list in order to build long-term range trends. Step 4) New to Lotto Logic Pro is the ‘Ticket Package’. Click on this toolbar button to process your ticket package. The ‘Ticket Package’ will automatically select the options you have made (see edit ticket package for more details) for your package. It can be 5 from Hot, 5 from Due or 10 from Hot and Due. Basically the ticket Package will generate the Tickets you want with just a click. Step 5) When this process completes you will then be asked if you want to save the tickets. You can say Yes and proceed to save now or say No and add some more tickets manually. Either way you should save your tickets. If you have selected No and now want to save your tickets click on the right button above. Once saved LLP will ask you if you want to open the Tickets into the ‘Ticket Checker/Selector’, say yes and you will now be in Ticket Selector mode. Now checkmark the tickets you are going to play and wait for the next draw. Manually) once you have the range of past draws set, you can start to select numbers from the Hot and Due number displays on the ‘Ticket Selection’ tab. You can have Lotto Logic Pro select numbers by clicking on the ‘Select’ button which will randomly select numbers from the Hot and/or Due numbers depending on the options you set in the selections above the ‘Keep’ button. You can also add numbers by clicking on and dragging these numbers to the display area above. Once you are happy with your set of numbers click on the ‘Keep’ button, which will add the ticket to the ticket list. This ends our 5 Step Quick Start, please read on for more in depth explanations of all the features and concepts of Lotto Logic Pro. 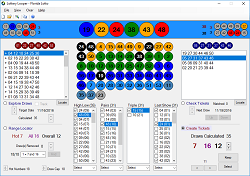 Ticket Selection is Lotto Logic Pro main interface. This is where you select numbers for future draws based on the information displayed here. This screen displays up to 14 Hot numbers and 14 Due numbers. You can also add personal numbers from the list on the left or use Edit My Numbers to edit personal number sets. The rest of the help topics for the Ticket Selection screen will break down each component and explain them in greater detail. The list on the left of the Ticket Selection screen displays the hottest numbers down through to the most due number. This descending list uses the letter H beside a number to indicate that the number is currently displayed in the Hot numbers. The letter D is used to indicate the number is currently displayed in the Due numbers. When the letter N is used, this indicates that the number is Not displayed and if double clicked can be added to My Numbers. To the right of the ball number after the equal sign are the total times that this number has shown up in the amount of past draws calculated. Right clicking your mouse in this list will bring up an options menu. From this option menu, you can select to display the totals of Winning numbers, totals of Bonus numbers and their combined totals by selecting Combined. Combined adds the total of winners and the total of bonus numbers to give you a combined total. The Unsorted option from the menu will display all the numbers from 1 or 0 to the last number in your lottery pool. Selecting Print on the menu will print the list currently displayed. Under the Program Options tab, there are options which allow you to add Hot and Due numbers as well as duplicate numbers to the My Numbers display. The numbers at the top of the Ticket Selection screen display the current set of numbers, which create your Ticket. Each number is color-coded to indicate from which display it came. Using the default colors, when a number is red it came from the Hot numbers; if it is blue, it came from the Due numbers. If you are using My Numbers and the number came from My Numbers it will be green. 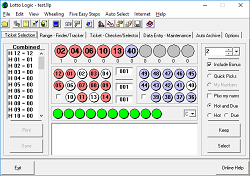 These numbers can be assembled using the Select button in the lower right or by clicking and dragging numbers from the Hot, Due and My Numbers displays to the Ticket Display. Right click on the numbers to sort them if you have manually added numbers. The number displayed below each ball is the combined total number of times the ball has shown up in the range of past draws calculated. These numbers are then added up to give you the total you see in the top text box in the center of the Hot and Due displays. Hot Numbers are the numbers which occur most often and are displayed in the left-hand box of the Ticket Selection screen. Up to 14 of the hottest numbers can be displayed. The hottest number is in the top left-hand corner, and the balls decrease in popularity from left to right and down to the bottom right. When the check box in the lower left is checked it turns the bottom 4 numbers into the hottest bonus numbers. If you select numbers using the Select button these numbers will be called upon for random selection, as well as the top ten winning numbers also displayed. Mainly, whatever is showing in the display box will be called upon for random selection. Due Numbers are the numbers which do not occur very often and are displayed in the right-hand box of the Ticket Selection screen. Up to 14 of the most due numbers can be displayed. The least popular number is in the top left-hand corner, and the balls increase in popularity from left to right and down to the bottom right. When the check box in the lower left is checked it turns the bottom 4 numbers into the most due bonus numbers. If you select numbers using the Select button these numbers will be called upon for random selection, as well as the top ten due numbers. Mainly, whatever is showing in the display box will be called upon for random selection. My Numbers are displayed in the lower section under the Hot and Due number displays of the Ticket Selection screen. My Numbers are numbers you pick to use and are created using Edit My Numbers or by double clicking the numbers with an N beside them in the list to the left. Numbers displayed here can be added to your saved My Number sets by right clicking on one of the numbers and selecting Save. You can save up to 5 sets of numbers which are often referred to as My Numbers in Lotto Logic. To add some of your favorite numbers you can bring up an edit window from the menu. In this editor you can add your favorite numbers and then save them to sets with a brief comment. You can save 1 to 10 numbers under each set and of any value from 1 to 99. However, if your lottery only goes up to 49 there is no need to add numbers higher than this, as they will never be called upon from random select. If you ever need to change a set of numbers you can right click on the set to bring it into the input boxes for editing. You can create number sets in two ways. One way is to use Edit My Numbers and type in your favorite numbers. Another way is to add numbers from the list to the My Numbers display and then right click on one of the numbers, then select Save from the corresponding menu. To display saved sets in My Numbers use the pull down on the right of the My Numbers display. You can call up 1 to 5 sets or use the C at the bottom of the list to Clear the entire display. To manually clear one number at a time in the display you can right click on the number and select Clear. To edit your ticket package select from the menu Edit then My Package. A new window will appear allowing you to select 0,5,10 and 20 tickets for Hot, Due, Hot and Due or Quick Picks. Once you have decided on the quantities of Tickets you want for your package click on Save. This feature will enable you to set up a package of tickets you commonly select every time you play. Lotto Logic Pro enables you to select numbers from Hot numbers, Due numbers, or personal choices. Whatever you decide to use is up to you and you can use any combination of these choices as well. There is no limit in what you decide to use and how many Tickets you decide to create. Later on you will learn how Range Finder (Trends) can also help in your number selections. You can select numbers to be drawn from one of three areas or any combination of these areas on the Ticket Selection screen. These options are on the right hand side just above the keep button. Select Hot to have numbers drawn just from the Hot numbers and the same method applies to Due numbers. You can also have numbers drawn from both areas by selecting Hot & Due. In conjunction to these options you can have numbers drawn from My Numbers by checking the Plus my nums check box. If there are numbers displayed there, they too will also be randomly selected from. First you must decide where you want your numbers to be selected from by choosing one of the options on the right hand side of the Ticket Selection screen just above the Keep button. Later on you will learn how Range Finder (Trends) can help in your number selections. Once you have made your decision click on the Select button. You will notice Lotto Logic Pro randomly selects numbers from the area or areas you have indicated. Below each number you will see a value. This is the current total of times this number has shown up in the amount of past draws calculated. The total of these numbers is shown in the middle of the Hot and Due displays. Below this total are two more boxes with numbers in them. The middle box is the highest total so far and the bottom one is the lowest total so far. If you switch to other options, the totals will be held for you if you return. For example, if you are selecting from Hot and move to Due, the numbers will change but the Hot totals are held for you. However, if you change the range of past draws all your totals will be cleared. Another way to select numbers is to drag and drop numbers into the Ticket display. This is called custom Tickets and the total will change as well. However, the highest and lowest totals will not update if you have made a custom Ticket exceeding one of these high and low values. The My Numbers option to the right hand side of Ticket Selection screen is normally grayed out until a couple of conditions have been met. One condition that needs to be met is a sufficient set of numbers to be available for selection. For example, if your lottery requires 6 numbers there must be 6 or more numbers available. The other condition is that all the numbers are within your lottery range of numbers. Quick Picks previously labeled Totally random in Version 3.0. Quick Picks basically are just the same as the Quick Picks you can get at your local store. They are numbers, which are selected by complete random selection. The numbers are drawn from your lottery range of numbers and are shown in white in the Ticket Display. If one of the numbers happen to be in the Hot, Due or My Numbers areas the number will be color-coded to indicate this. Include bonus is located on the right hand side of the Ticket Selection screen. Normally you want to keep this option checked. Un-checking this option will remove all bonus totals. When unchecked you see just the top winner numbers and not the Hot and Due numbers from combined totals. The best way to get an idea of what this does is to look at the numbers from the list and change the list to winners and uncheck this option. You will now see that the numbers in the Hot and Due areas coincide with the list. Once you are happy with the Ticket you have created, click on the Keep button near the lower right. Clicking this button will save the Ticket to the list below. You may add as many Tickets to this list as you want. If you are unhappy with a Ticket you have added, simply double click the Ticket and it will be deleted. Once you double click the Ticket, it will automatically be deleted without any notification and it cannot be retrieved. The Ticket list display is located at the bottom of the Ticket Selection screen. When you click the Keep button the numbers in the Ticket display are added here. Here is an example of how it will look followed by a description of what the extra information means. 2. The 001 displays the current Ticket number. 3. The numbers 03 07 12 28 37 43 display the set of numbers to play. 4. The 136 displays the total for all the numbers. 5. The 112-151 indicates that you were using 112 past draws from a total of 151. 6. The D indicates that the numbers came from the Hot & Due displays. Each component changes according to the selections and options you have made. Right click on the display to bring up a menu. This menu allows you to show 5, 10, or all of the Tickets you have created. This is handy if you make a lot of Tickets and notice that the display refresh times are slow. If the refresh is slow, lower the display down to 5 or 10. Don not forget to change this if you want to print the entire list as only what is showing in the list will be printed. When the Ticket list has at least one set displayed the print button becomes active. This button is located on the left of the Ticket Selection screen just under the list. As with all print routines in Lotto Logic Pro only what is showing in the list will be printed. To print the entire list right click on the list display and select All. The Save Tickets button is located on the left of the Ticket Selection screen under the print button. When anything in the list is added or removed the button will become active. Once you save what is in the list the button will grey out again until another Ticket is removed or added. It is best to wait until you have made all your choices before you save. See Ticket Checker/Selector for more information on viewing your saved Tickets. Range Finders main function is to find the best possible range of past draws to use, which shows a promising amount of matches accumulated over 1 to 5 past draws. What Range Finder does is compare up to 5 past draws against the Hot and Due numbers at that time, never including the pick it is comparing in the overall calculation. As an example, lets say there are 100 past draws entered. Range Finder starts by calculating what the Hot and Due numbers in the range of 1 to 99 would be. It does not include the 100th draw because this is used to compare against the Hot and Due numbers. It acts like it does not know the outcome of the next draw after 99 and removes the 100th set of numbers for comparison. Next, it will take out the 99th set of numbers (and the 100th draw is already removed). It then recalculates the Hot and Due numbers at this time (which would be 1 to 98) and then compares the 99th draw to see how things match up. Next, it will take out the 98th set of numbers (and the 99th and 100th draws are already removed). It then recalculates the Hot and Due at this time and then compares the 98th draw to see how things match up. This continues until 1 to 5 past draws have been compared (Later you will learn how to change the past draws compared from anywhere between 1 and 5). Once it has checked all the past draws specified, it now moves to the range of 2 to 99 and repeats the above pattern. Then it will move to 3 to 99, 4 to 99, 5 to 99 and so on repeating the pattern above. Once it has run through the entire database of past draws, it stores these results in the top right corner of the first two tabs under the pull down. Now, lets say Lotto Logic Pros powerful Range Finder feature, not found in any other lottery program, reads 78 and 89 past draws as the ranges with the most matches overall. You can switch to either of these ranges and select Hot and/or Due numbers from the range of past draws that you decide to use. You can start the Range Finder in several ways. One way is to use Auto Calc (short for Automatically Calculate) which can be started by clicking on the lightening bolt in the main toolbar or by clicking on the Calculate button located on the Range Finder (Trends) tab. Another way to start or use Range Finder is by changing the range manually and viewing the results in the Range Finder (Trends) tab. You can change the range by clicking on the up and down arrowheads beside the text box with the past draws value in it. This is located at the top right corner of the Range Finder (Trends) tab and is always present in the Ticket Selection tab as well. Auto Calc will always run through the entire database of past draws no matter how many past draws are currently calculated in the program. The Range Finder (Trends) display always shows the 5 past draws that are compared against the Hot and Due results from the range of past draws currently calculated. Beside each past draw set are two numbers. The first number displays how many matches there were for this past draw; the next is the total of all the matches from that set and each set above it. The 5th last number is the grand total of matches. You can also view the top 14 Hot and Due numbers and the matches on the display above. To the right of the Hot and Due displays is the total of Hot and/or Due matches. On the right are check boxes for you to change to obtain either just the Hot or Due number matches. All displays change accordingly to your choice. To view the matched results of each past draw you can highlight the past draw set you want to view and the results will be displayed in the Hot and Due numbers above. There are several options Range Finder has from which you can choose. You can switch to the results of just Hot numbers or Due numbers. These two checkmark boxes are located on the right above the Track button of the Range Finder (Trends) tab. Un-checking both boxes provides no results and has no purpose. Auto Calc also takes into consideration these selections when starting a Calculate process. Another choice for you to make is determining which set of numbers you want to compare – just Winners, Bonus or their Combined values. These options are located on the right above the Hot and Due check mark boxes. Changing these options changes the display accordingly and clears any results stored in the Range Finder result pull downs. Calculate also takes these options into consideration. Before you run a Calculate session you can change 3 separate options which Calculate will take into consideration while running. The first option is whether you want to compare Hot numbers, Due numbers, or both Hot and Due numbers. You can change these options by checking or un-checking the Hot and Due check boxes above the Track button on the Range Finder (Trends) tab. Your second option is whether to compare against Winners, Bonus, or both Winners and Bonus number(s). You can change this option on the right-hand side of the Range Finder (Trends) tab above the Hot and Due Check boxes. Thirdly you may change how many past draws you wish to compare against by right clicking the Calculate button. You can select from 1 to 5 past draws for results. The display will still show up to 5 past draws and their results but Calculate will only use the amount you specified and store the results under the pull down in the top right hand corner of the Range Finder (Trends) tab. When you switch the amount of past draws, you need to click on Calculate button to start the process. You will notice that the button has changed from Calculate 5 to whatever you selected. For example, lets say it was switched to 3. The button will now read Calculate 3. What options you wish to use is up to you. After you run a Calculate process you need to check the results by using the coinciding pull down. Every draw you should track at least one of the best ranges. In the center of the Range Finder (Trends) tab you will notice that 1 is separated from 2,3,4 and 5 past draw range results. The reason this was done is to simply identify the range of past draws that were the best range for the last draw. It is highly recommended you have at least 30 past draws entered before you start to track ranges. Below the Range Tracker list you will notice an average and popular result. The Average result is the average of all the ranges you have tracked so far. The Popular result displays any range, which has shown up more than once, or the range, which shows up most often. Ticket Checker/Selector is used to open saved Ticket files you have created from the Ticket Selection tab. Lets say you have Tickets in the Ticket Selection tabs list. At the moment do not have any sheets to fill out for your next draw, so you save them to a file. You now can open them in the Ticket Checker/Selector at a later time when you have the sheet to fill out. You can also archive all the Tickets you make by using a filename with the draw date as its filename. You open your saved Ticket files by clicking on the Open button located in the lower right corner of the Ticket Checker/Selector tab. This is the only location you can open these types of files. All Ticket Checker/Selector files use an *.tks extension. You can clear or close the file by using the Close button located on the left-hand side of the display box. You can save your Ticket file as another file by using the Save As button. You can print what is displayed in the display box by using the Print button. You can also delete any highlighted entry by clicking on Delete. If nothing is highlighted no action will take place when clicking on delete. You can also sort your display by the results of each Ticket set. Clicking the sort button will sort the file descending and ascending. There are two modes, Ticket Checker and Ticket Selector. The Ticket Checker mode checks the tickets you open for matches against the numbers displayed above, which are past winning results. When in check mode you cannot check and uncheck tickets. This mode will only let you check for matches against the last draw of your lottery. After you have checked a set of tickets and want to save the match results checkmark the Locked check box. Note: Once checked no updated in matches will appear until unchecked and once unchecked and changes are made the locked results will be lost. Ticket Selector is used to checkmark the tickets you want to play for the next Lottery. When you print in this mode, the Tickets that are checked will have a little dash beside them. Refer to Ticket Selection for play for more details. When in Ticket Selector mode you can switch displays by right clicking on the sort button. You can scroll through all your past winning draws to accumulate past matched totals, or roll back 5 or 10 to see how the numbers did over the last few draws. You can sort by the Totals of frequencies each ticket received from the Ticket Selection tab or by matches or totals matches of hits over several past draws. When checked Auto Add automatically adds any Ticket you make to the Ticket list when using the Select button. If you click the Keep button a dialog will appear notifying you that Auto Add is enabled. When using the Select button by default your numbers are automatically sorted. If you do not want your picks sorted, uncheck the option Sort selected picks. There are three options you may change for adding numbers to My Numbers from the list on the Ticket Selection screen. Normally, Hot and Due numbers displayed cannot be added. If you want to add these numbers, check the option Allow Hot and Due numbers to be added. Normally, duplicate numbers cannot be added. For example, if you have added a 4 to My Numbers you cannot add another 4. If you want to add duplicate numbers check the option Allow duplicate numbers to be added. Finally the numbers added are normally sorted. If you do not want them sorted check the option Do not sort my numbers when adding. You can change the colors of the Hot numbers, Due numbers, and My numbers displays to any color you desire. If you pick dark colors you may want to try white text to see the numbers more clearly. To change the colors click on the number 99 in the Program Options tab. To reset your color options click on the Defaults button also located on this tab. It is true, the odds of winning the big one are phenomenal. But can you increase your odds? This is where the logic of Lotto Logic Pro comes in. Can Lotto Logic Pro guarantee a big win? No, and no other lottery program can either. However, Lotto Logic Pro can give you informative information to help you base your number selection using logical concepts which other lottery programs simply lack. By using Range Finder, Range Tracker and other features of Lotto Logic Pro you will not only increase your fun but at the same time you may very well increase your odds of winning. For example, when you enter the last set of numbers your lottery has drawn, run Calculate using 1 past draw as your setting and you will likely see a past draw range which had all the numbers required in the Hot And Due numbers display. So, if you had picked those numbers right you could have won, and won big. Simple as that! Luck still plays a big role but by using the logic of Lotto Logic Pro, who knows? Read on into Concepts to understand the logic behind Lotto Logic Pro. The main focus is to try and find a range which shows promising results over 1 to 5 past draws. A new feature called Range Tracker will help you track range patterns which show consistent winning ranges over long periods of time. The range of past draws is a very powerful feature of Lotto Logic Pro. It helps you decide how many past draws to use and shows patterns in the numbers. Calculate is usually the best route for most players but if you are a power player you will probably use it manually. Lotto Logic Pro is not magic, some silly lotto tracker or even some data over killing graphing nightmare; it is a program packed with powerful logical concepts and tools that are used to help you select numbers, easily. Many say that the machines, which draw the winning numbers every draw, are not perfect. What they believe is that some of the balls either weigh more or less than others. Many of the balls are not perfectly round; the mechanisms on the machine itself are not perfect and are subject to wear and tear. This is where Range Finder and Range Tracker come into play. Unfortunately you don not know when they change machines or parts, or replace the balls. Luckily for you, you now have Lotto Logic Pro to help you by using Range Finder and Range Tracker. That is what it does – it tries to determine the best possible range of consistent number showings to help you select numbers during this time frame. This is just a recommendation in believing that too much information can do more harm than good. After a year or two I think it would be safe to say that they are not using the same machine or parts and have replaced some balls or all the balls. I think it is even safer to say that they are not using the same machine or balls from 10 years ago provided your lottery has been around that long. An average of 1 to 2 years worth of entries keeps your data fresh with current results. For example, if you have 10 years worth of entries, Range Finder will find the best ranges using these entries. Unfortunately the machines or parts and balls have probably changed and so the results are technically correct but really incorrect because the machine and ball variables have changed. Here is where the fun begins. It is now up to you to decide what strategy to use. Select numbers from Hot or Due numbers or both. Select what frequency number you want to use – high or low. How many past draws do you want to use and from what combination of Hot or Due or both? You can even choose from Combined numbers, Bonus, or Winners only. There are many decisions and Lotto Logic Pro is your tool to help you every step of the way. It is even up to you to decide how many past entries you want to maintain in your database. For example, if you know that your lottery changes balls and machines every 6 months, you might want to keep your database really fresh and maintain only six months worth of entries. You can even add your favorite numbers into the mix. Every time you play use Range Tracker to track the best ranges. Most of all the biggest strategy is to have fun, and now you can have fun playing the lottery using Lotto Logic Professional Version 7.0. No longer do you have to use purely random illogical picks, which add no excitement to lottery playing. You now can strategize, theorize, and try to conquer the ultimate goal – TO WIN THE BIG ONE!